Introduction: Tirupperunturai (Aavudaiyaar Koyil) near Arantaangi, near Thanjavur is a revered Saivite pilgrimage center, closely associated with the life of the Saint Poet Maanikkavaacakar. This temple is relevant not only for its religious significance but also for its array of exquisite sculptural work. The temple here is also known as the Jnana Sabha, and Tirupperunturai is also known as Sivapuram or Kokazhi. Antiquity: The vast temple here is said to have been built by none other than the Saint Poet Maanikkavaacakar - the author of works such as Tiruvaacakam, Tiruvempaavai, Tirukkovaiyaar, Tiruppalliezhuchi etc. Many renovations have been carried out here over a period of time, and much of the current structure dates back to the 15th century. Deities: The presiding deity here, is Aatmanaathar; there is no Shivalingam to represent the deity. Only the pedestal, Aavudaiyaar is located in the sanctum, hence the name Aavudaiyaar Koyil. His consort Siva Yoga Nayaki is also worshipped in the iconless form, at a site said to be the very spot under the stala vriksham Kurundai tree, where Maanikkavaacakar received spiritual initiation from his Guru, who was none other than Shiva, at Tirupperunturai. Maanikkavaacakar is also enshrined in several forms - as a minister, a saint etc. The parivara devatas usually seen in niches in Saivite temples are absent here. Tirupperunturai is also known as Aadi Kailasam or Atheetha Sabha - as it has six Sabhas i.e. the Kanaka Sabha, Chit Sabha, Sat Sabha, Aananda Sabha, Ratna Sabha and Deva Sabha in comparison to the five at Chidambaram. 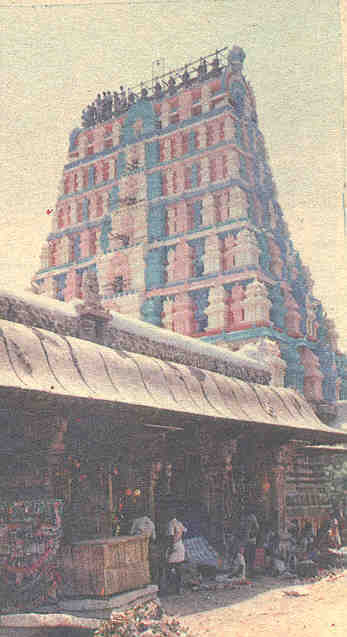 The Deva Theertham and the Deva Rahasyam are some of the distinctive features of this temple. It is beleived that Maanikkavaacakar himself built these six sabhas, and covered each of them with 21600 plates of copper. The Temple: The Aavudaiyaar Koyil, covering an area of over 10 acres, faces south. This temple has been constructed in such a manner that the setting rays of the sun, strike the sanctum, despite the fact that the innermost sanctum is cloistered within three circumambulatory paths. The exquisite stone work in this temple could be mistaken for woodwork. The thousand pillared hall has several delicately crafted pillars. Noteworthy examples include depictions of the Oordhwa Tandavam of Shiva, Kaaraikkaal Ammaiyaar, Dhanurdhara Subramanya and so on. Legend has it that Manikkavaacakar a royal minister of the Pandya Kingdom built this temple out of funds earmarked for the purchase of horses for the royal palace and that when time came for him to display his stock of horses, jackals miraculously turned into fine steeds. (See Maanikkavaacakar - Life, Legends and more). It is to be noted that this particular incident Tiruvilaiyaadal is celebrated in the Madurai Meenakshi temple. The Saint Manikkavaacakar, hailed from the Pandya Kingdom. Shrines associated closely with him are Madurai, Tiruvaadavur, Uttirakosamangai and Tirupperunturai. Festivals: The annual festivals celebrated here are Aani Tirumanjanam and Maargazhi Tiruvaadirai as in Chidambaram.